Media captionImam Gamal Fouda, who was leading prayers, thanked the people of New Zealand "for their tears"
Imam Gamal Fouda, who led the prayers, said: "We are broken-hearted, but we are not broken." 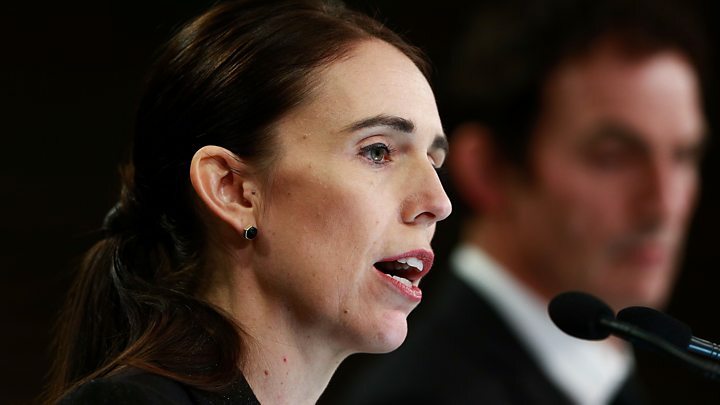 In an address beforehand, Ms Ardern said: "New Zealand mourns with you, we are one." "According to the Prophet Muhammad... the believers in their mutual kindness, compassion and sympathy are just like one body. When any part of the body suffers, the whole body feels pain." The Imam of Al-Noor mosque, Gamal Fouda, was there when the attack happened and said the gunman "broke the hearts of millions around the world". "We are alive, we are together, we are determined to not let anyone divide us." "We like to think that we're a liberal community, but we know that there are dark parts," said Mr Clark, 72. "It will positively affect New Zealand and maybe we'll have even more to offer the world." Many mosques across the country are opening their doors to visitors, and human chains will be formed outside some in symbolic acts of protection and support. A mass funeral is being held for 30 of the dead, including the youngest victim Mucaad Ibrahim, aged three , who was killed at the Al-Noor mosque. "I'm wearing this in solidarity today," said hairdresser Melody, pointing at a blue headscarf adorned with gold crucifixes. 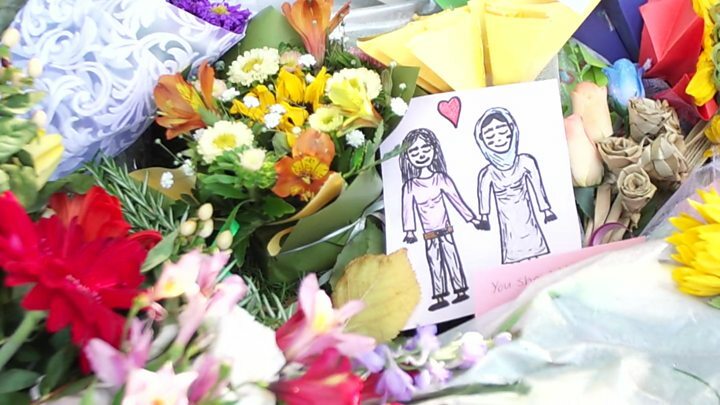 Like thousands of others in the city of Christchurch, she's been struggling to come to terms with the horror of last week's attacks. All week advertising hoardings have been beaming positive messages back onto the streets: "This isn't us", "Kia Kaha Christchurch" and "No room for racism here". Friday was a chance for Christchurchers to bring those sentiments together in one place at the same time and to pay their respects to the dead. People flocked from all corners of the city and flowers and messages of sympathy were laid at the foot of the park's towering oak trees. A Maori biker gang gathered in the enclosure for Muslim prayers to offer their protection. One had a large red crucifix emblazoned on the back of his leather waistcoat. It felt symbolic of New Zealand's positive, multicultural response to the killings. When the tributes were over people started pouring out of the park, back into the city and their everyday lives. I approached Christine McCartney. She was born in the city in 1951 and has lived here her whole life. "It's all been deeply saddening," she told me, "but I feel positive about the way this has brought us all together." 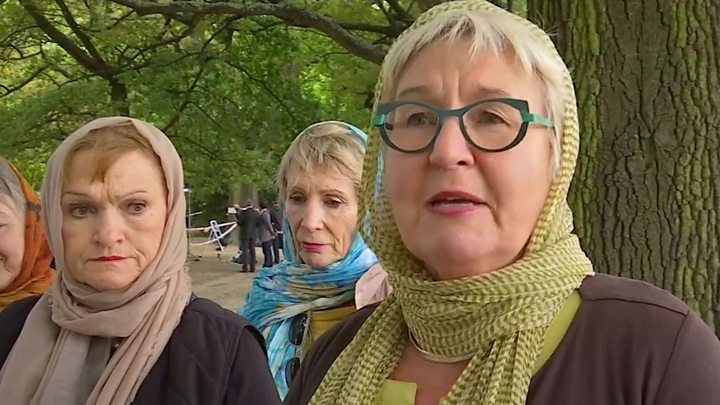 Media captionRobin Molony: "In solidarity with the Muslim women, we are wearing our headscarves"
"I know many New Zealanders wish to mark the week that has passed since the terrorist attack and to support the Muslim community as they return to mosques," she said. "How we choose to reflect during the silence will be different for each of us. Everyone should do what feels right for them, wherever they are - at home, at work, at school." One person who took part said: "All the bodies are washed. We finished around 1.30am. It was our duty. After we finished, there was a lot of emotion. People were crying and hugging." She said she expected new legislation to be in place by 11 April, saying: "Our history changed forever. Now, our laws will too." The buy-back could cost up to NZ$200m ($138m; £104m), but Ms Ardern said "that is the price that we must pay to ensure the safety of our communities".